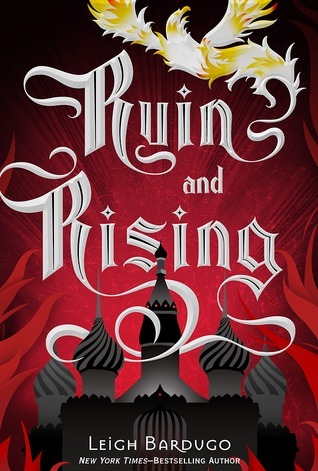 Ruin and Rising, the final book in Leigh Bardugo’s Grisha trilogy, lived up to all my expectations. I couldn’t have asked for more from this debut series! I wasn’t a fantasy fan when I started the first book but Leigh Bardugo has definitely turned me into one now. Leigh Bardugo wastes no time diving right back into the story. Ruin and Rising picks up shortly after the ending of Siege and Storm. Readers will immediately recognize the situation that Alina is in. I’m normally a little confused when I dive back into a series but Leigh Bardugo gives just enough information about the previous books that I knew exactly what was going on. While the story is a bit slow to start, it’s made clear very quickly how high the stakes are in this final installment. Alina has taken her role as the Sun Summoner very seriously. She doesn’t consider her a saint like the Apparat does but she knows that she is the only one who can possibly defeat the Darkling. However, the power has also gone to her head a bit. She knows this and she worries constantly about what the third amplifier might do to her. She’s willing to sacrifice her own life for the lives of others though. Alina is a very selfless character and while she may not be a saint, she sure is willing to be a martyr. There wasn’t a page in Ruin and Rising where my heart didn’t break for the position Alina was stuck in. The day she was discovered as the Sun Summoner, her life was pretty much forfeit. That girl from the first book, with a crush on her best friend and hope for a future together, is no longer there. Speaking of the best friend she had a crush on: Mal is not the same either. It’s clear he and Alina love each other but what isn’t clear is what their future holds. Mal has become a huge part of Alina’s force against the Darkling. He may just be human but he knows how to fight and he’s willing to give up his life for Alina. He’s just as lovely as he was in the first book but it’s clear how much he has grown since then. As for the Darkling, he really hasn’t changed much since the first book. He’s still evil and unnecessarily cruel to everyone that means something to Alina. However, he does show that he has a heart in Ruin and Rising. He comes across as cold and heartless for most of the trilogy but there are glimpses beneath his exterior. I still can’t see why people would want Alina to end up with him but I was pleased to see more to him and his backstory. Also, I did get the special edition from Barnes and Noble which included a prequel story featuring him and Baghra. If you have the option, get that version because that short story showed a very different side to him. While the ending didn’t come as a shock to me there were plenty of times throughout the book that I had to pick my jaw up off the floor. Leigh Bardugo managed to throw me for a loop more than once in Ruin and Rising. Leigh Bardugo is an author who does not shy away from killing off her characters. I won’t say any more than that but just be prepared for tears. Overall, Ruin and Rising solidified my love of Leigh Bardugo’s writing, characters, stories, etc. I can’t wait for more from her. If you haven’t started this series, now is the perfect time to binge read them all. Couldn’t read the review since I’ve only read the first book so far, but so glad you gave it five stars! I am loving this series so far, and am so eager to continue.